Like a number of smaller cruiseships, LE DIAMANT commenced her life as a car ferry, before being converted for a more luxurious role. She dates from 1974, and was originally to be named FERNHILL but was launched by her Norwegian builders - Kristiansands Mek Verksted - as the ro-ro freighter BEGONIA. In 1986, she underwent major alterations, emerging as EXPLORER STARSHIP. Her new owners, Exploration Cruiseline, went into receivership just two years later, and the ship was taken over by a Japanese company which later formed Seven Seas Cruises. With new owners came a new name - SONG OF FLOWER - and a new career cruising in Alaskan waters. 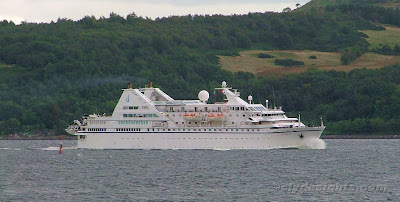 Following a merger with Diamond Cruises, SONG OF FLOWER became a member of the Radisson Seven Seas Cruises fleet, remaining with that company until 2003. That year she was sold to a French company, and now trades under the French flag as LE DIAMANT. She has an overall length of 124.19 metres and a gross tonnage of 8,282 tons. She can accommodate 226 passengers. LE DIAMANT had arrived earlier in the day from Dublin, and her next port of call was to be Portree.